In this Post: Learn about encouragement through rewards. 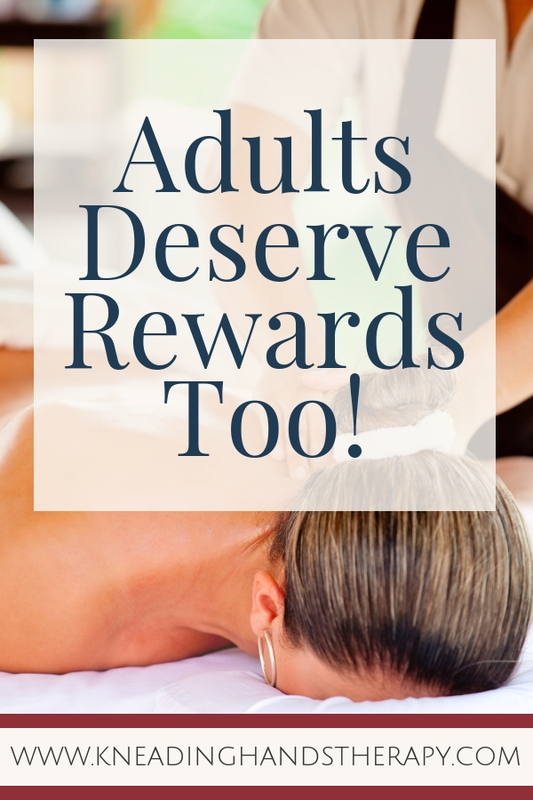 Of course our favorite way to reward yourself is with a nice relaxing massage! When was the last time you thoroughly rewarded yourself for something you accomplished? Never underestimate the power of self-love. If we depended on everyone else to show us gratitude and satisfaction, we would deprive ourselves of happiness. There is no shame in honoring yourself for something you a task completed or project well done. We often associate encouragement through reward with childhood—receiving dessert after finishing dinner, winning a metal after a sporting event, etc.—when we should be rewarding ourselves regularly as adults as well. When rewarding ourselves, we should figure out ways to make it both mentally and physically beneficial. A reward doesn’t always have to include cupcakes and wine (which are both extremely acceptable). Rewards can also be simple acts we use to soothe and nurture the mind and the body. Rewarding yourself with a bath isn’t only great for relaxation. It has a lot of health benefits too. Being horizontal has been clinically proven to improve our mood and optimism. We associate being horizontal with relaxation and vulnerability, particularly in the bath, which in turn could trigger a sense of comfort (think surrounded by warmth in the womb). Some scholars say this position gives us a sense of security. Baths can also help relieve skin conditions, such as psoriasis or eczema. High heat and the soaking process helps reduce pain and swelling associated with some skin conditions and muscle pain. Hot baths before bed can contribute to a good night’s sleep as well. Benefits range from immune system strength to increased production of melatonin, a bath before bed will help you float right off to Dreamland. Reward and health benefits go hand in hand! We underestimate the power of reading. Not only is it a great way to relax and unwind, but we are reaping many benefits just from picking up that book or magazine and rewarding ourselves with a good read! Staying mentally stimulated can slow the progress of disease, such as Alzheimer’s or Dementia, just by exercising your brain. We forget that the brain is a muscle and needs to be stretched and challenged in order to stay healthy. Reading has also been proven to reduce stress! Just by submerging yourself into an adventurous novel or an article in your favorite magazine, you can slip away from the daily grind and transport yourself into a different dimension. Next time you reach a goal, grab a book and celebrate! Everyone loves a tasty meal—especially when someone else is preparing it for you. Rewarding yourself with a night out is a great way to pat yourself on the back! Whether it’s your favorite restaurant around the corner, or a new bistro that popped up in town, give your taste buds a treat and marvel in a delicious meal. Treating yourself to the movies is a great way to relax and rewind after completing a task or goal. Take your family, friends, or just enjoy alone! Going to the movies offers you an opportunity to shut down the busy part of your mind and submerge yourself into entertainment. Let yourself indulge in the one area you usually end up taking care of yourself. If you wash your own car, take it to the car wash and let somebody detail it for you. If you color your own hair, make an appointment at your favorite salon and treat yourself to a cut and color. Take a break from the hassle of cooking dinner and hire a private chef for a night. Call a housekeeping company to do your spring cleaning. If these options aren’t appealing to you, choose something that you find yourself angsty about when the time comes to tackle it. Removing a task or chore from your routine is a great way to reward yourself for a job well done. Those of us who get to call Steamboat Springs our home are blessed beyond words! Join the many people who come to Steamboat to relax and unwind and be a tourist for a day! Walk through the museum or take a stroll around downtown and wander through the shops and galleries. We sometimes get lost in our own town and forget how much charm and appeal it has. Reward yourself with the gift of home. We are so lucky to be here. If you live in another town besides Steamboat, we’re sorry for you, but you can still take the time to enjoy all the amenities and activities you find yourself too immersed in everyday life to enjoy! Whether its work, cleaning the house, or mowing the lawn, reward yourself by taking the day off. Routine is essential for daily life, but it becomes tiring and redundant when we don’t take a moment to mix it up. Honor yourself for a job well done with a day to just BE—no responsibilities, no deadlines, just a day to yourself. Have you always wanted to try a pottery class or maybe do a paint-and-sip session? We tend to put activities like this on the backburner since they don’t seem absolutely necessary to our busy lives, but it’s important to treat yourself to something new! Whatever it is that you have been holding back from trying, go out and do it. Not only is it a great way to escape from the daily grind, but it gives us a chance to detach from what is our routine and helps aid in the creative process. We may be a little biased, but rewarding yourself by honoring your body is a great way to show yourself you care. Whether you want deep tissue work, or mix in other treatments such as cupping, hot stone, or aromatherapy, there are plenty of ways to get a full body treatment and relax after completing a task. At the end of the day, you deserve to reward yourself for a job well done. We hope you get a chance to use one or more of these options in the process! Always remember that reward isn’t just for your little ones, it’s for you as well. Set your goals and create a reward system so that you can treat yourself!